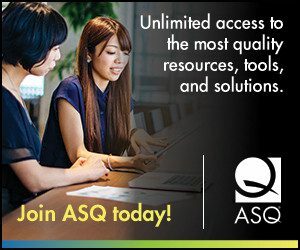 Welcome To World Quality Month! Welcome to the sixth annual World Quality Month! This event has truly grown into a global celebration of quality, a better understanding of its impact on the world, and focuses on quality practitioners whose knowledge, experience, and passion make improved quality available for virtually anyone who asks. Those who work in quality sometimes struggle to explain its value to “outsiders”—or even “insiders”–at their own organization. There’s no better time to remedy this than the month of November. We encourage you to take a proactive role in World Quality Month this year! If your organization hasn’t made any plans yet, it’s still not too late. You can download ready-made World Quality Month posters and display them in your office. Host a quality “open house” for your department and invite colleagues from other areas (be sure to offer snacks). Download the fact sheets on the ROI of quality and fun quality trivia to share with your colleagues and business associates. Take the sample World Quality Month Proclamation to your local government officials and ask them to sign it. Invite them to your site for a World Quality Month tour. The proclamation or a photograph of you receiving it can then be sent to your local media and used to recognize your company’s or organization’s contribution to quality and your celebration of World Quality Month in November. See more details in the World Quality Month celebration guide. Also for a simple, last minute idea to celebrate World Quality Month, put an etag in your email signature to let your co-workers and business associates know how much value you believe quality offers to the world, not just during November but throughout the year. For those events you have planned, now is the time to confirm times, staffing, and logistics for each event. Send a reminder about the event, either through internal newsletters or email to all staff. Hold planned events such as lunch and learns, open houses, games/trivia as scheduled. However, several days before the event, make the reception and security departments aware of the event in case they get any questions about it. Test any technology you will be using (laptop, projector, etc.) at the event the day before in case there are any problems. On the day of the event, set up your space (e.g., projector, snack table, etc.) and take photos to document the fun activities and send to your local media and/or for your social media accounts. Also, it’s not too late to submit your quality success stories, case studies, and events. The World Quality Month site welcomes visitor content and we will continue adding new content throughout the month of November. Visit the World Quality Month site frequently for updates and new materials. I was able to find good advice from ypur blog articles.